363 in stock Need More ? 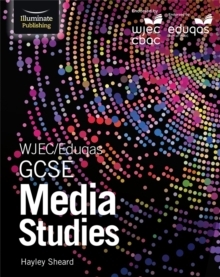 Written by an experienced examiner for the new specification and endorsed by WJEC, this visual and engaging student book will help learners develop their knowledge and understanding of key issues and introduce them to a theoretical framework for analysing the media. // All areas of the new specification are covered and supported by numerous highly-illustrated examples. // The theoretical framework underpinning media studies is explored and applied to a range of media forms and products. // A dedicated chapter on the Non-Exam Assessment element of the specification provides clear guidance on how students will be assessed. // Exam guidance chapter introduces students to practice questions and the new assessment objectives helping students with the skills they need for assessment. // Extension tasks will help to stretch and challenge higher ability students.